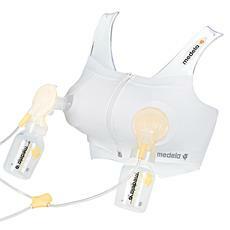 The Medela Easy Expression Bustier leaves your hands free, so you can do something else at the same time, e.g. reading or surfing the internet. Thanks to its zip you can easily put on and take off the Easy Expression Bustier, with nothing underneath or over your nursing bra. The Easy Expression Bustier should fit snugly. The person to whom I gave it is very pleased with it as it works well for hassle-free expressing.